There is nothing more thrilling and fun than riding a longboard. The sport lets you bring out your inner daredevil. You can ride in a way that has enough danger to get your adrenaline pumping or more conservatively to prevent you from breaking any bones.While most would confuse the sport with normal skateboarding, it is miles different. First off, the board itself is different! It’s much longer than a normal skateboard, which adds to its stability, traction, and durability. These boards are incredibly versatile. You can use them to go on a relaxing ride through town or to live on the edge while speeding down a gnarly hill. There are four different types of riding styles, allowing you to use the board how you want. Cruising can be used to get you from point A to point B. It’s faster and less tiring than walking. Slolam riding involves weaving between objects and other obstacles flawlessly. Free riding is more traditional, focusing more on tricks. These riders spend their time mastering grabs, slides, and sticking that awesome stunt. For the most adrenaline, you can ride downhill. This involves speeding down hills as fast as possible. So you’ve decided you want to give a longboard a shot…so what now? It may seem daunting at first, but with a few general tips, you’ll be riding in no time. Before you do any buying, you need to see if you’ll even like the experience. Most likely, you’ll love it. However, you don’t want to invest in a great board without even stepping on a board first. Find a skating buddy and give it a shot. You may fall, but after a few minutes of getting comfortable, you can skate around a parking lot to see if you want to explore further. After that, you’ll need to get the gear! One of the biggest mistakes you can make is buying a cheap board. This board is going to protect you from the fast moving pavement beneath you, so you’ll want to pick a board that is made from high quality materials. It’s good to do some research beforehand. Figure out what brands make the best boards. Wheels, decks, trucks, bushings, and every other aspect should be looked into. While higher quality usually means a higher price tag, peace of mind and durability is well worth the investment. Additionally, look for a cool design! Let the board represent your personality so you can show it off proudly. 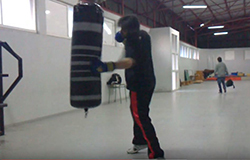 Beginners should definitely invest is some good safety equipment. When you are first learning how to ride, you will fall. There’s no avoiding it. It is like riding a bike. It requires a lot of trial and error to get the hang of. A helmet will make sure you get to see the fruits of your labor. They’ll help to avoid potentially life threatening injuries. You should do some research and find a helmet that’s protective and stylish. Additionally, riders should get some knee pads, elbow pads, and wrist guards to avoid road rash. Longboards are like cars in the sense that they contain numerous parts that may need replacing. Many guys know their cars inside and out and can spot a problem by the feeling of the ride. A longboard should be no different. Riders need to understand how the board works and how to improve any issues. Understanding how to assemble a board and replace parts can save a lot of money and headaches in the future. As with any sport, riding a long board involves falling from time to time. Beginners will experience a lot of falls on their journey to awesome riding. Don’t be afraid to fall! It is part of the learning process and will help you to learn how to avoid mistakes in the future. That being said, there is a right and wrong way to fall. When falling off a board at high speeds, riders need to roll into their fall and avoid using their arms to stop themselves. With the right protection, you’ll avoid injury. As weird as it sounds, you should practice falling correctly so that it becomes second nature. After you fall, get back on your feet! It’s impossible to become a pro over night. It’s important to not get discouraged and give up after a wipeout. Have patience and use those falls as motivation. Before long, you won’t be a beginner and those falls will just be a great story to tell. This is a great board for beginners. At 44 inches long, this board has incredible maneuverability and control. It is made for cruising, but that doesn’t mean that it is incapable of performing tricks. The kick tail makes it a great board for kick and balance tricks. Material wise, this board great. The trucks are 7 inches and made from aluminum. While this isn’t the strongest material ever, it is certainly durable enough for constant use. The deck itself is made from hardwood maple and bamboo, giving it strength and an awesome look. The board looks very modern and earthy with the polished wood and black paint. Overall, it’s a great board that will help you learn the basics while giving you a smooth ride. 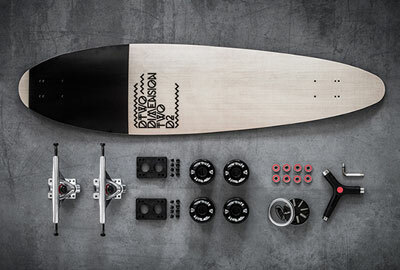 This board combines a number of different design elements to create a truly unique experience. While it is predominantly used for cruising, the versatile design makes it great for those just starting off to those who have mastered awesome tricks. The 9.5 inch wide deck gives riders 9.6 inches of leverage with every turn. This helps riders make sharp and smooth turns flawlessly. The deck has a very unique shape. The company took elements from concave boards and modified it to create something new. It has smooth concave curves that round off at the ends. It eliminates wheel bite while giving riders increased control and navigation. The bearings also help to give riders a very smooth ride. The trucks are made from an aluminum alloy, so they are durable enough for tough rides and tricks. It has 70mm wheels with 70% rebound and a hardness rating of 83A. This makes it perfect for downhill carving. Overall, the board is incredibly versatile and can be used for a number of different riding styles. Both novice and experienced riders will find it to be a fantastic board. Those who want to go with a classic design and shape will love this board. It has a classic pintail shape that is widest in the center of the board and tapers off on either side. This gives riders a better sense of center and eliminates wheel bite. At only 39 inches long and 9.4 inches at its widest point, it’s the perfect size for beginners. It’ll give riders complete control and stability for cruising. The trucks are made from aluminum, which gives riders adequate strength and durability. That being said, the board isn’t made for intense tricks. The urethane wheels aren’t the best for bombing and rough pavement. 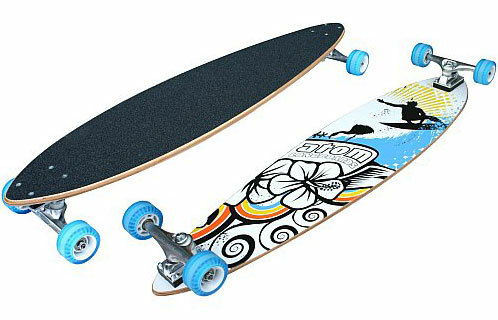 Instead, this board is best suited for cruising and beginners. It offers quality components for an affordable price. Plus, it just wreaks of classic style. With its unmistakable shape and bright colors, it’ll deliver a truly classic experience in every sense of the word. If you want a board that will do it all, this board is the one for you. It’s made to adapt to any riding style you throw at it. At 36 inches, this board gives riders the stability they need for everything from cruising to downhill bombing. It also has sidewinder trucks and smooth bearings to give riders maximum control and smoothness in their turns. This makes it great for slolam and free riding. The uniquely shaped deck is an adaptation of a concave design, helping to avoid wheel bite and providing versatility. This board does it all while looking awesome in the process. This board is made for more experienced riders or beginners who want to ride the more advanced styles. It’s designed for downhill riding with fast speeds. 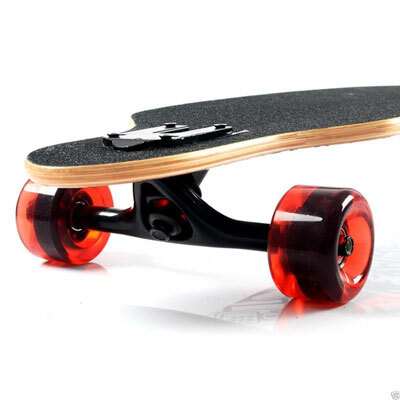 It has incredibly durable trucks and specially designed wheels that help to maximize speed. The aluminum alloy components are top notch, capable of standing up to a lot of abuse. The chrome bearings and unique wheels are made to give you the smoothest ride possible, whether you are bombing or just cruising through the streets. They also help with control and maneuverability. This is important for downhill riding. It helps you to avoid anything that may get in your way, ultimately helping to avoid injury. The deck is made from 9 ply maple wood and shaped in a concave design to eliminate wheel bite. When it comes to color and graphics, there are numerous options. You can easily find a design you’ll want to show off. Nice article! I think the most important thing in picking out a longboard for beginners is to first determine what types of riding style the person is looking to pursue. 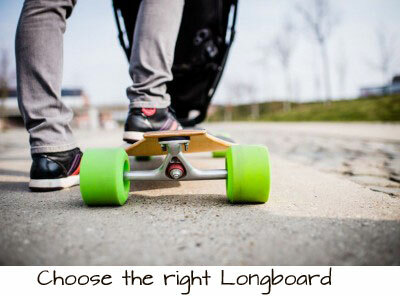 Doing that alone can significantly reduce the number of longboard options! For example, if I am looking solely for a cruising longboard for city use, I’d probably limit my search to cruiser boards which are smaller and easier to maneuver in the city.